Now back in stock, ever popular 3mm turquoise cabochons! These are one of the (actually many now) stones that I struggle to keep in stock. This material is light greenish-blue with a bit of a colour range going from a bit more green to a bit more blue – do shout if you have a preference. It’s stabilised, as is very common with turquoise, but not dyed. There’s a bit of matrix on the underside of some of the stones, but not across the top and hey, at least you know it’s real! It’s pale tan matrix, so for those of you who are interested, this tells you that the turquoise formed in sandstone. Now, turquoise is quite strongly linked with the ‘southwestern’ style of jewellery, but it also lends itself very well to smaller, sleeker designs, and works equally well with both silver and gold. For inspiration, below are some examples of small-scale, perfectly formed turquoise jewellery. 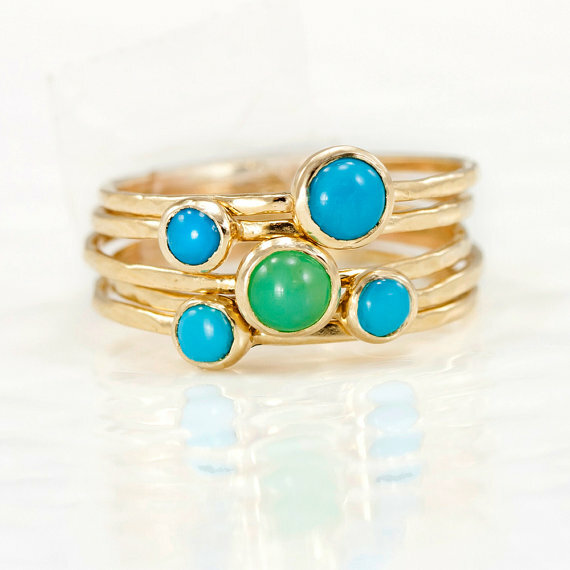 From left: Holly Presley’s turquoise ring features a 3mm turquoise sitting on an organic drop of silver; Rita Moehler’s sterling silver turquoise bangle features six turquoise stones on a solid silver ridged band; Melanie Casey’s set of 5 gold stack rings features 3mm and 4mm turquoise stones (and one green chalcedony!) set in solid 14k gold and Thalassa Jewellery’s silver pod earrings feature 3mm turquoise stones set in oxidised silver pods. To shop 3mm cabochons, click here; to browse all turquoise cabochons, click here.